When choosing an aesthetic practitioner the last thing you want to do is go and visit just anyone. I was kindly invited to visit the SY Clinic in Harley Street in Central London. If you rather watch my video Blog experience on YouTube. They have 3 different clinic locations in Leicester, Surrey and Harley Street. I made my way to Harley Street. As I waited in the waiting area , I didn't know what to expect. I've seen their work on Instagram and it looked well done. Their clinics are not only on Harley Street but also Leicester and Surrey. The aesthetic practitioner welcomed me in his office and sat me down to have my initial consultation. I love that he took a good look at my features. When addressing symmetry he displayed poise and mannerism which was outstanding. He was able to pin point the size imbalance in my lips. Hence, we were going to do the lip filler procedure. These below are my lips before the procedure. If you focus one side is thicker than the other. I was particularly intrigued how he was able to explain the issue without making me feel inadequate. He explained what procedure would bring out more balance in my natural features. It was impressive how small amounts of filler can tweak appearance in a positive way. We went through all the outlined possible complications that in very few cases can occur prior to having the procedure done. The cost of 1ml of Revolax is £180. I was explained the procedure and what filler would be used. I was advised that less than 1ml would be needed to balance my lips and give them a much more desirable look. The injectable filler type used was Revolax. Ali injected primarily the right side of my lip to make it's shape closer to my left side. He made sure he contoured my lips with the filler and gave my bottom lip a boost in the middle section. 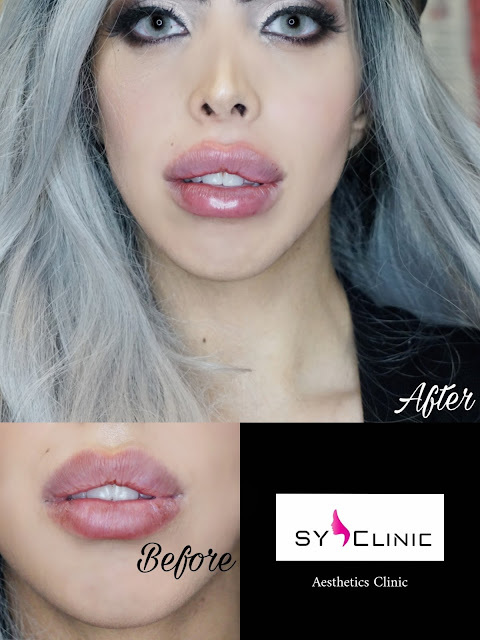 He used a mixture of different techniques and injected different areas to make the lip more symmetrical. The feeling was exactly that of a slight sting and I personally did not feel in pain. To be honest, I feel he had quite a soft touch injecting unlike others who can be heavy handed. The lips were slightly augmented to create the perfect lip. The improvement in my lips was instant as Ali had a big lip to start off with, but if you have thinner lips you may need to gradually build them up. 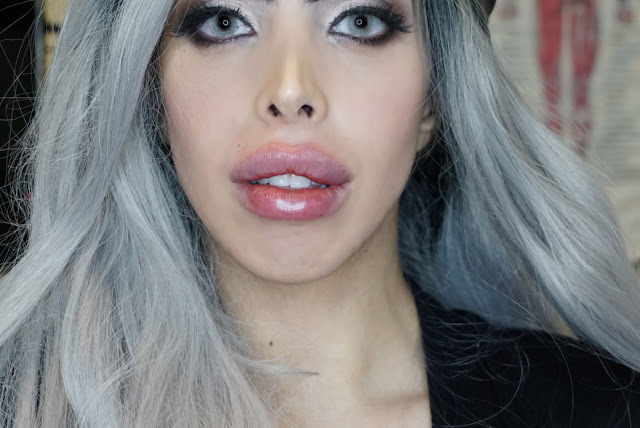 Note that they are seriously swollen both in my YouTube video and pictures as I just had the lip filler injected. Post treatment included no drinking alcohol, no smoking and a few more recommendations which include resting. Future planning includes solely maintenance which can vary between people (8-14months). Depending on how your body reacts to the filler and also the needle going into the lip area , bruising and tenderness can vary. In my case, as you can see from my YouTube blog and my daily shots I had minimal bruising. In regards to swelling one side was more swollen than the other especially the first 4 days as I had a slight lip imbalance so more was injected on my right side. 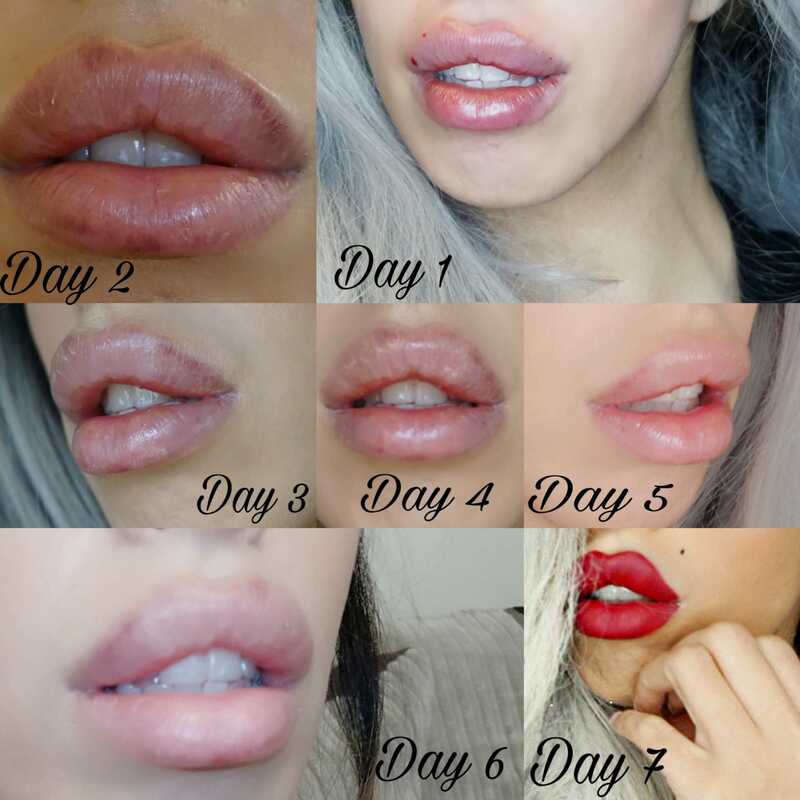 The below collage is a 7 day picture log of how my lips were healing after having had lip filler. 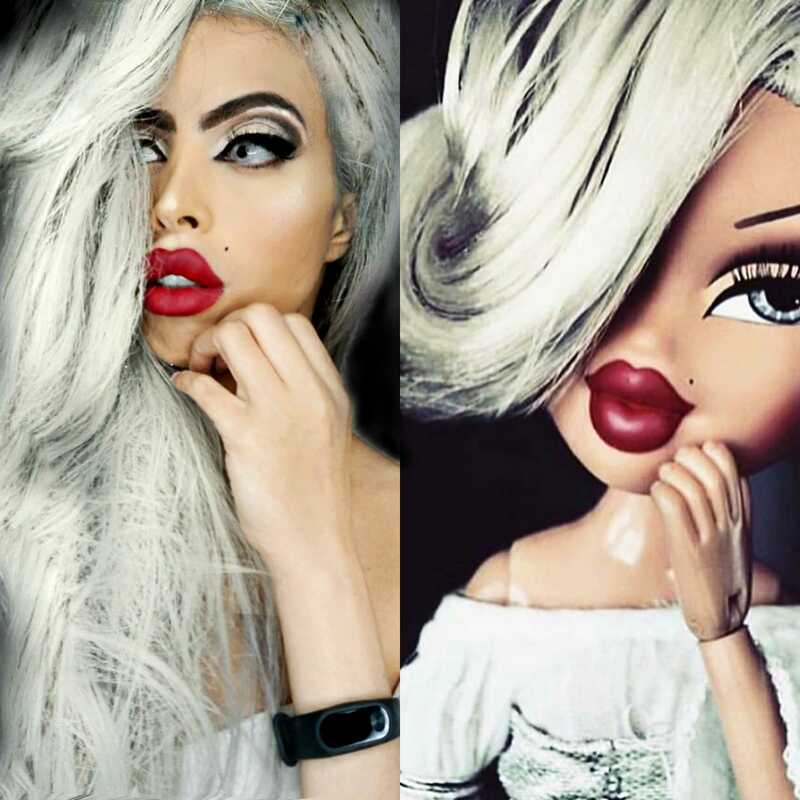 As the swelling subsided by day 7 I decided to recreate a Bratz doll look since I had the lips to go with it. I can happily say that I was happy with all the information and options the aesthetic consultant provided me with. The procedure in itself was like that of a sting as the needle penetrates the lip. I could already see a huge difference eventhough my lips were extremely swollen. It's now exactly a week since I had them done and they seem to have mostly healed and with make-up bruising is not visible. As Ally taught me, less is more. I had less than one ml injected but the difference is huge. I am extremely happy at how well the filler has taken to my lips giving me the look I had in mind. Beware though not every body heals the same way so make sure to listen to the possible side effects you may encounter. Every procedure carries risks that I urge you to take into consideration so it's not a decision to be taken lightly. I was particularly impressed that I wasn't advised to do procedures which I didn't need for monetary gain. I am happy to have had the chance to be given a lip makeover by the lip bae King. 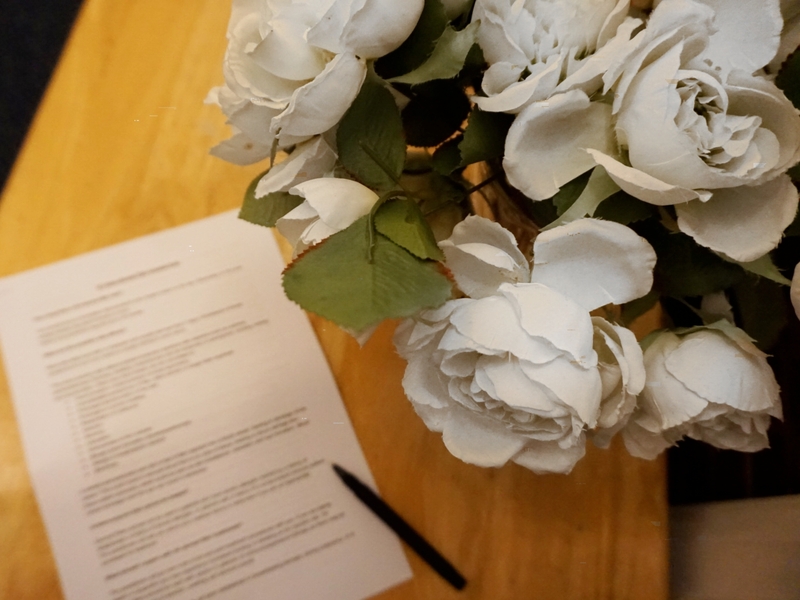 My decision to have a cosmetic procedure was one that I didn't take lightly and even though this is a collaboration I made sure to check the practitioner credentials and expertise. At the end of the day this is my body and it's important to choose the right clinicians to have a safe and desired experience. Remember that fillers are temporary and the body disposes of them in its time and even asymmetrically. Hence, if you were to decide to have your lips augmented you have to consider the fact that maintenance is a must. If you would like to know why I decided to have lip filler, feel free to ask me to do a post on the matter. Although this post is a sponsored post, all opinions are my own and truthful. Would you like to know about more cosmetic procedures? How do you feel about them? Make sure to follow SYCLINIC on instagram. This is their website with pricing for the different procedures.